A Disneyland vacation is something parents and children dream of and save for. Disneyland vacations can be magical, but the price tag attached to them, not so much. When you price out a Disney vacation, be prepared for a little sticker shock. But fear not! There are plenty of ways to save money on a Disney. Today, we are spilling the beans on how to do Disneyland for cheap. My family loves a good Disneyland vacation. My husband and I went a few times together before having kids, but it was that first visit with our oldest son that really got us hooked on Disneyland. Since then, we have made many Disneyland trips. But we are not rich. So how do we afford multiple Disneyland trips each year? I am one of those people who loves searching out a good deal, from groceries to electronics, and even to vacation. So you can bet over the years I have found some amazing deals on Disneyland vacations. Today I am going to share some of the best, and lesser known ways to save money on Disney. I am even going to tell you about the lucrative “Disney Red Card Trick” which works for not only Disneyland, but Walt Disney World as well. This post contains affiliate links. We may earn a commission for purchases made through these links. So first, let’s get one thing out of the way – Disneyland for cheap is going to be relative. What is cheap to one person is not cheap to another. So what do I mean by Disneyland for cheap? I mean you will save a good amount of money on your Disneyland vacations with the tips and tricks I am going to share with you. In fact, these tips help my family save hundreds of dollars on Disneyland vacations. So what are these secret money-saving tips? Let’s get started! If you have kids, there are two ages you need to remember- three and ten. 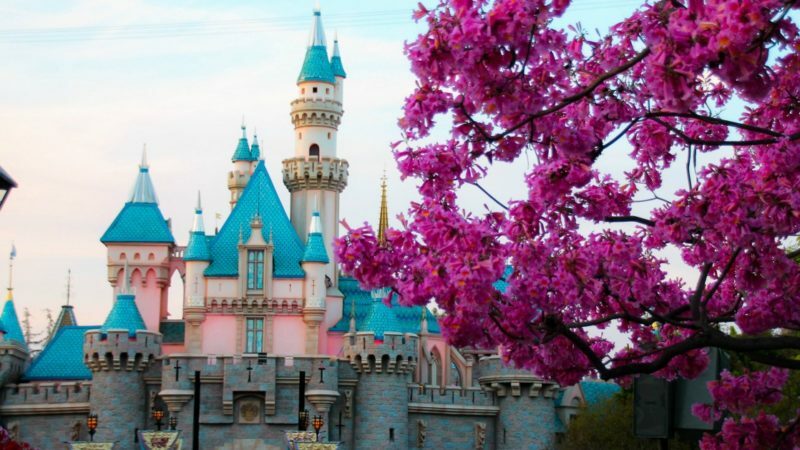 Planning to do Disneyland for cheap means trying to find the best deal out there, and that includes making the trip while your kids are under these two ages. Children under the age of three are free, and children age ten and over are considered adults, meaning they cost more. Take advantage of when your kids are under three or ten to save money. A little known tip – kids do not age at Disneyland. In other words, if you enter the park your first day and your child is 2 years old, even if you are there on her birthday, you don’t need to buy a ticket. Ticket prices are based on child’s age the first day of entry. 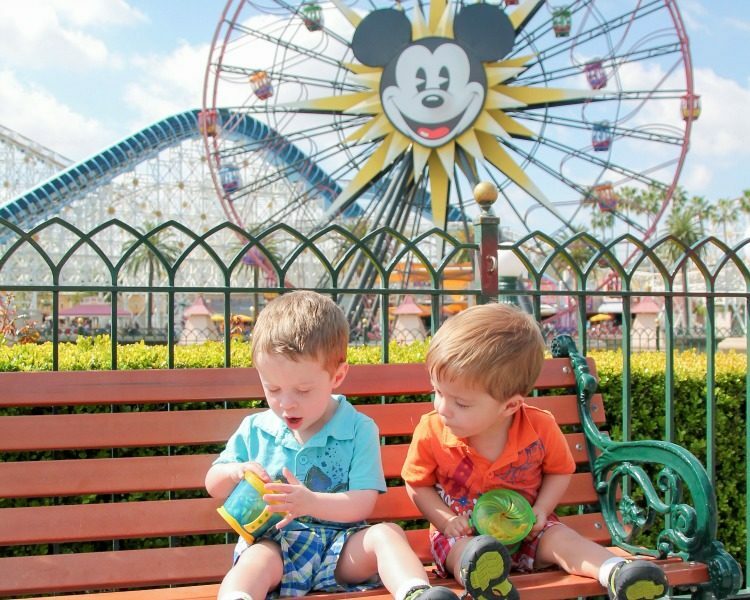 TravelingMom Tip: Save money on Disney and create special memories by taking your toddler to Disneyland the week of their third birthday. Disneyland has no shortage of food. My favorite treat is a Mickey Premium Ice Cream Bar, and I love a good chicken dinner at the Plaza Inn. But the food in the parks is also pretty expensive for the most part. Food at Disneyland can be one of your biggest expenses, or one of the best ways to save money. 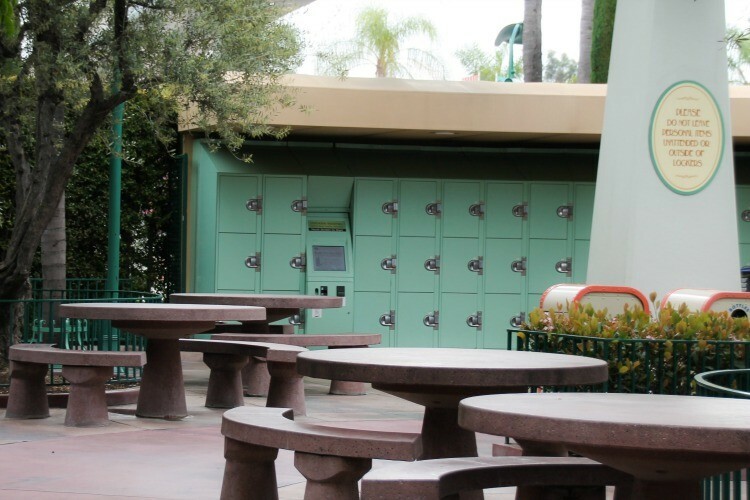 You can easily bring food in to Disneyland Resort for your family. Did you think outside food and drink were banned? A lot of people think this but you actually are allowed to bring in food and drink as long as it is not in a glass container or alcohol. In fact, you can even bring in a small soft sided cooler. My family likes to bring a larger cooler and utilize Disneyland’s picnic area in the esplanade. We can rent a medium locker for $12 for the entire day. That is less than we would spend on a meal, or even snacks, for 2 of us. We head out there for lunch, dinner, or both. We also like that it is a nice break from the hustle and bustle of the parks and there is room for our kids to run around a little bit. A pretty unconventional way to save money on your Disneyland vacation is to consider going more often. Confused? If you end up heading to Disneyland every eighteen months, maybe consider changing your Disneyland visits so that you can make two trips in a 12 month period. Then instead of purchasing park tickets, purchase Annual Passes for your family. 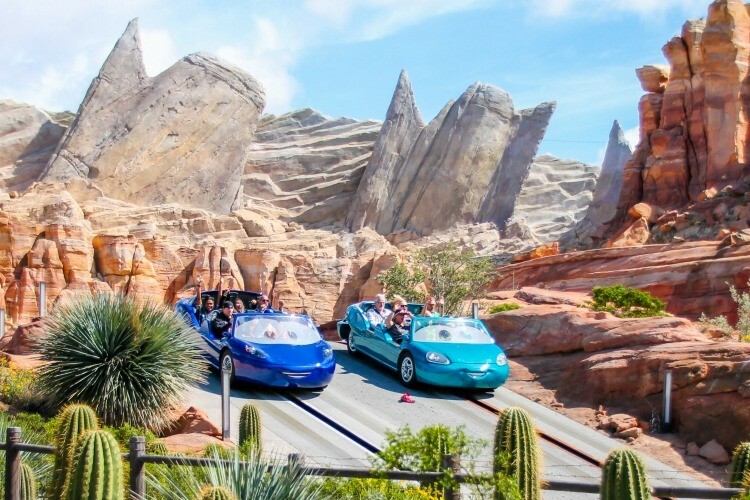 In general, if you spend at least four days each trip in the park, and purchase Deluxe passes, your Annual Pass will save you money on admission for those two trips. In addition to the admission savings, your Annual Pass gets you discounts on food and merchandise in the park. Many local hotels and other businesses also offer Annual Passholder discounts. 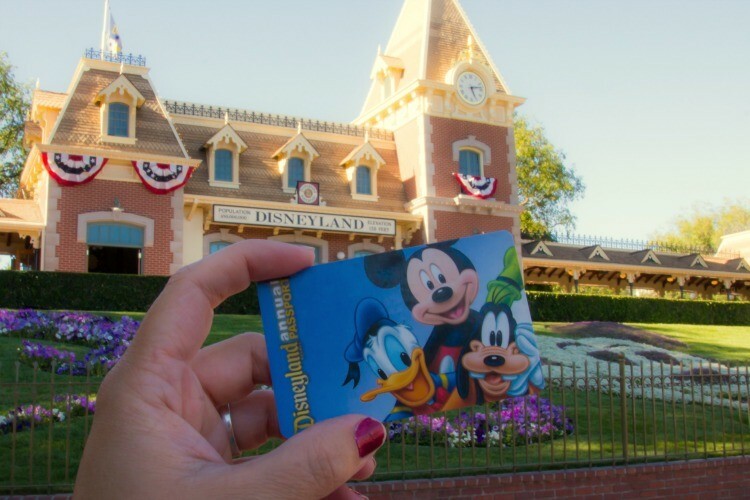 TravelingMom Tip: Have at least one member of your family purchase a Signature Annual Pass. You get free parking and a larger discount with the Signature level passes. Once you take those two trips, then feel free to take a year or two away from Disneyland. Or keep renewing your pass and continue visiting the happiest place on earth. Annual passes do have a pretty hefty up-front cost, but use our next tip to help with that and still go to Disneyland for cheap. If an Annual Pass is not in the cards for your family, make sure to get the best Disneyland ticket option for your family as it can save you money in the long run. If you are a Target Red Card holder, you are in luck! You can save 5% off your Disneyland vacation. The Disney Red Card Trick has been around for a while, yet many people still don’t know about it. If you want to know how the Disney Red Card Trick works, fear not! I even made a video about it, sharing how I saved $75 on my annual pass purchase alone. One thing I want you to remember if you want to save money on Disneyland vacations is that, unlike at Walt Disney World, it is not that big of a deal to stay off site. In fact, many of the Good Neighbor hotels are closer than the Disneyland Resorts. Staying off property will automatically save you hundreds of dollars. Many Walt Disney World regulars automatically think they need to stay on property to book a package. That isn’t the case at Disneyland. Not only can you book packages directly through Disney, but you can book through other outlets as well. In fact booking through other authorized sellers is one of my favorite ways to save money on Disney. When I want to book a package because it is quick and easy, I use Get Away Today. They not only have discount Disneyland tickets (which you can buy without booking a package) but they also have a large hotel selection and they get you deals like 4th nights free. You can price and book your vacation with them by clicking the button below. Then compare to see how much you save. Even better is that you can book a vacation with them for $125 down with the final payment due two weeks before travel. Now that you know how to save money on Disney, it is time to book your trip. 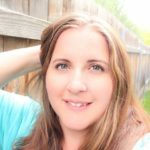 Before you choose your dates and book your trip, be sure to check out our FREE Disneyland E-Book with all of the best tips from TravelingMom. We cover it all from holidays to park tips and more. 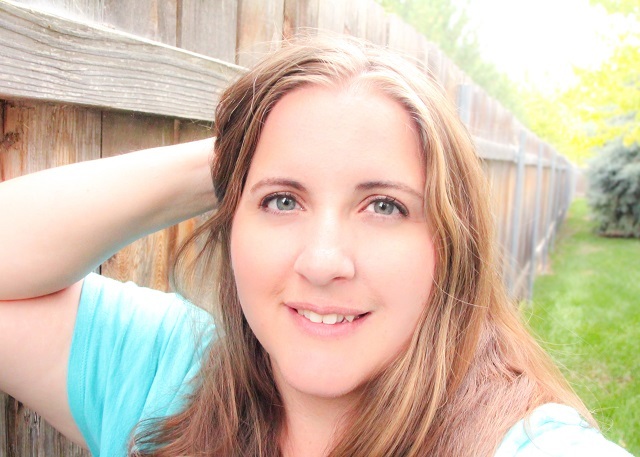 Thanks so much for your blog and videos. I am using some of the tips already! I am also a huge fan of Target’s RedCard “secret”. Your card stash looks like ours before a trip. Haha! My question is this: link to the Disney spot for cashing in Disney gift cards? Can you point me to it? I don’t see it below as stated in the video. Red Card Trick? what is it? We are going next month. Should we buy our tickets before going or when we get there? Love your work, Your post really helps us to enjoy disneyland tour without spending too much money. Keep sharing good work with us.